Steinbrenner’s poetry team poses with the Poetry Jam’s volunteers as well as the school media specialist, Dr. Jennifer Dillon. Alexandra Mosher held “Barry the Bee,” the mascot of the Echo Literary Magazine. 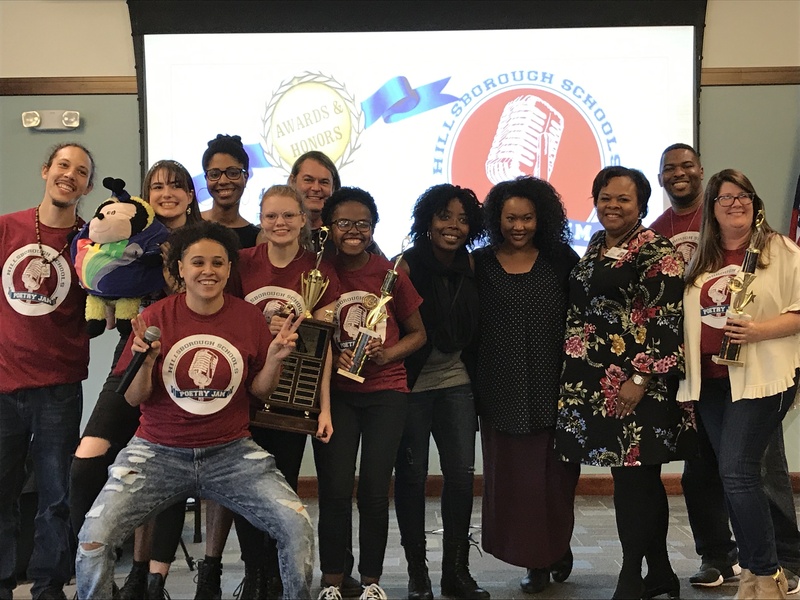 For the past three years, Steinbrenner has taken home the third place prize in Hillsborough County’s annual District Poetry Jam. This is a competition where students from all across the county come together to share their slam poetry in front of a panel of judges, and listen to other students express themselves through spoken word. This year, however, Steinbrenner’s poets took home first place with their group poem, “Said and Heard.” This team consisted of senior Anna Moye, junior Jordyn Dees, and sophomore Alexandra Mosher. In November, when Steinbrenner held their own Poetry Jam, Mosher performed the piece by herself and won first place for the school. However, when it was announced that this year students could compete as a group at the competition, she decided to include Dees and Moye in the poem who won second and third place for the school. “I knew that performing as a team would make the words so much more impactful, and I think that’s what really made us unstoppable,” said Mosher. The piece is largely about standing up for oneself, and against what others say someone can or cannot be. The poem inspires listeners to rise above the negativity and pressures of others, and embracing who one truly is, no matter what others may say about it. “‘Said and Heard’ is about dealing with verbal abuse, and being told that you can’t do something or that you have to be a certain way. It’s about trying to push past the people telling you what you have to be,” said Mosher. The poem revolves around the three words “worthless, foolish and perfect,” creating a balance between three different forces one might feel or one might get called. “Said and Heard” contains lines such as “my efforts are worthless,” “my efforts are foolish” and “my efforts are perfect.” Although when Mosher originally performed the piece alone it was certainly powerful, having each of the girls represent a different word brought a whole new level to the poem. “There’s a part in the poem where we’re all building towards all saying each of our words at the same time. Lexa would say a line, and then Anna would join her, and then I would come in so that we would finish the phrase together, and then I said ‘perfect’ while Anna said ‘foolish’ and Lexa said ‘worthless’ all at the same time. I think that was a really special moment in the poem and was definitely amazing with three people performing it,” said Dees. At last year’s competition, Dees took home third place with her poem “To the Girl Who Feels Powerless,” which was about using one’s voice to speak up for what one believes in. Although this was Dees’s second District Poetry Jam, this was her first time competing on a poetry team. “Last year I performed my piece alone, but this year when we found out that we could do group pieces, I thought it was super cool that Lexa wanted to change her peom to be a multi-voice poem as opposed to her doing the piece by herself. It’s somewhat different being in a group rather than just performing by myself, but it was definitely a great experience and I felt like it was cool being able to depend on Lexa and Anna, we really had to trust each other,” said Dees. Although this was the first year that Steinbrenner took home the first place prize in the District Poetry Jam, next year’s students will surely be motivated by the success and only continue to push themselves further in their poetry, and at next year’s competition.